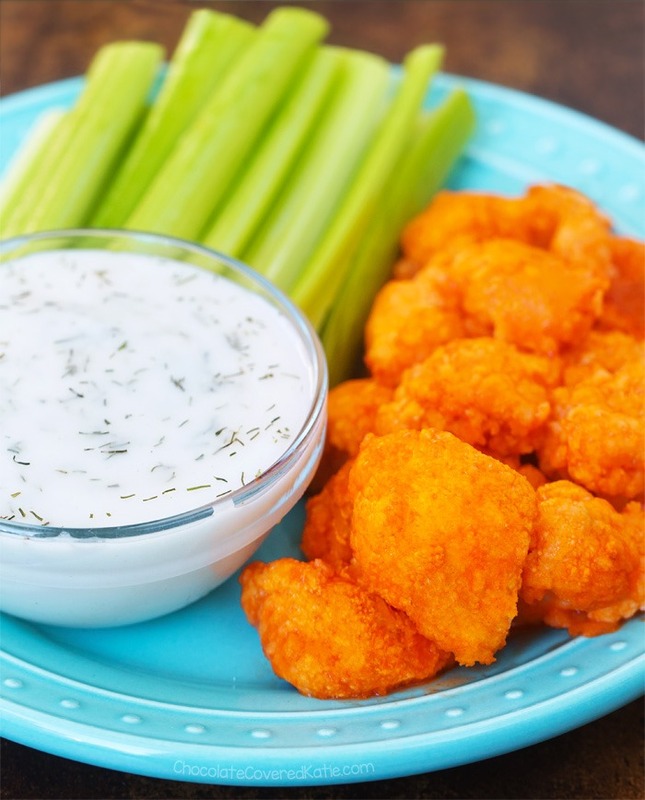 Buffalo Cauliflower Wings - Perfect For Game Day! Spicy, savory, crispy, baked buffalo cauliflower wings – perfect for game day! Okay, let’s make one thing clear right away. These cauliflower buffalo wings DO NOT taste ohmigosh just like real buffalo wings. If you find any recipe that claims cauliflower is going to taste just like meat, run far away. Cauliflower is not meat, cauliflower will never be meat, and cauliflower buffalo wings are never going to fool anyone into thinking they are chicken wings. 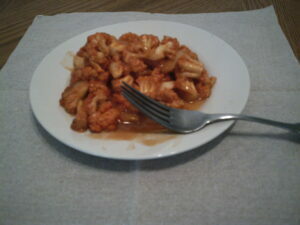 That being said, these cauliflower wings are delicious in their own right. There’s no need to treat them as a substitute for the real thing, because they are the real thing! 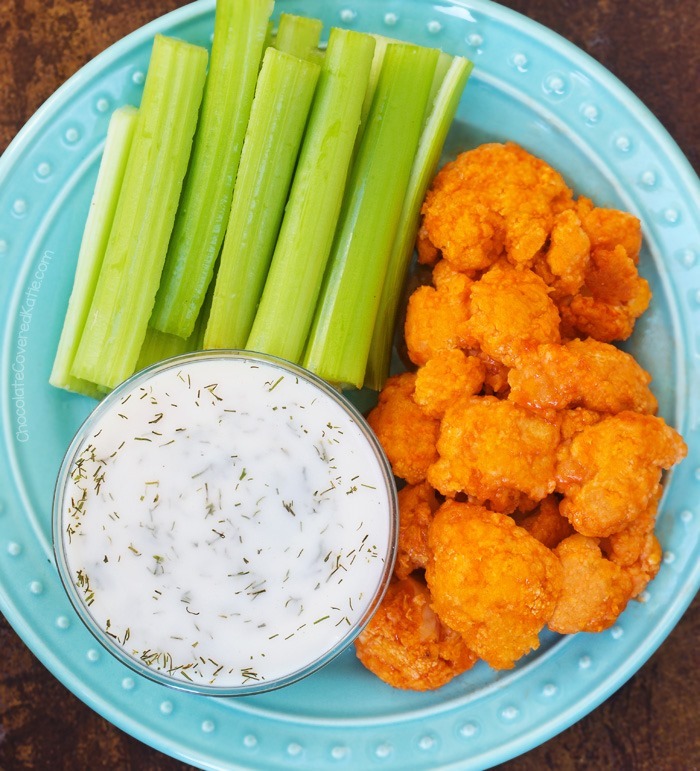 The completely vegan buffalo wings make a great healthy game-day snack, and they’re especially good dipped in ranch dressing. I made the buffalo cauliflower bites last weekend for a football-watching party, to test them out and gauge everyone’s reactions. 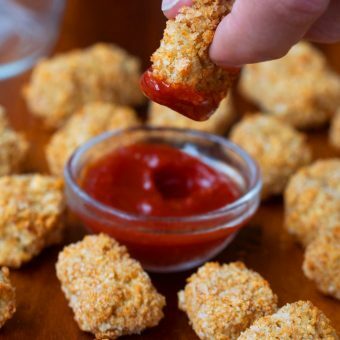 Being 100% honest: Some people thought the idea was too crazy to try, and one person who did try them fully admitted he didn’t like them because they weren’t meat. 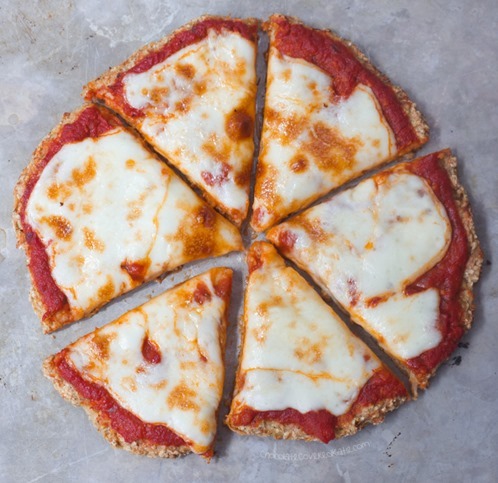 But everyone else—all non-vegetarians in the group—gobbled up the cauliflower wings, and more than one person commented on how they appreciated having a healthy option amidst all of the pizzas, cookies, chips, and beer. A large batch of the cauliflower was completely gone by the end of the night, with multiple requests for the recipe. Also being 100% honest: The celery was not completely gone by the end of the night. To this day, I still know of only one person in the world who actually loves raw celery. While there are many recipes out there for buffalo cauliflower wings, I decided to come up with my own recipe—adapted from my Shake & Bake Cauliflower—because I already know I love that recipe. Just thought I should warn you! Preheat the oven to 425 F. Line a large baking dish with parchment. Spray the florets with oil spray or toss with a little oil, then place in either a very large bowl or a large ziploc bag. Toss with the flour and garlic powder until evenly coated. Finely crush the breadcrumbs, either in a blender (easiest method) or by placing them in a bag and crushing with a rolling pin or heavy object. Add the milk of choice and then the breadcrumbs to the cauliflower, and toss to coat. Arrange in one layer in the baking pan. Bake on the center rack 25 minutes. Combine the oil or melted butter spread with the buffalo sauce (because the fat helps the sauce adhere to the cauliflower). Drizzle on the cauliflower, then stir to coat all sides. Bake another 15 minutes. After this time, I like to broil for up to 5 minutes, watching so it does not burn. Serve with ranch dressing. We are crazy about these cauliflower recipes. 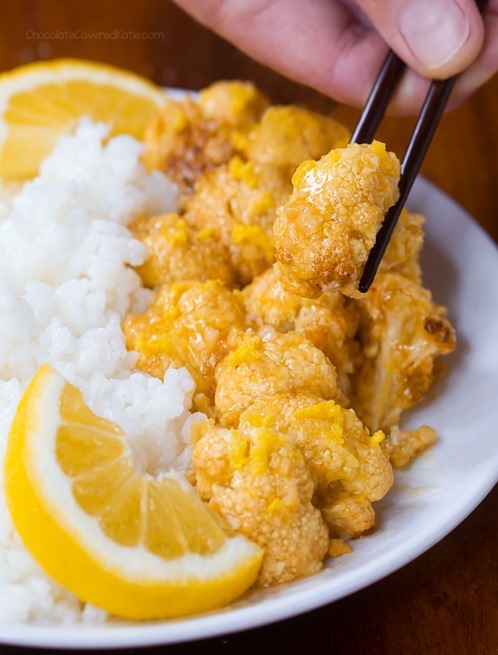 I made your crispy lemon cauliflower and it was totally incredible. Wow. Maybe it helps I pick my lemons right off the tree! 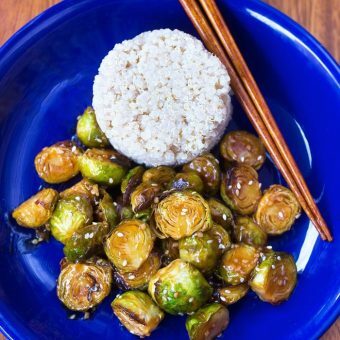 I love the sesame sauce too– I add peanuts and call it Kung Pao! Can’t wait to make the buffalo. Thanks. I wonder if this works well with broccoli in place of cauliflower? Hmm don’t see why not! Be sure to update if you try! I have always wanted to try this! Totally making it next week! After having these at a vegan restaurant years ago, I have always wanted to make them myself! I’ve tried before with not as much success, but these look spot on! Will have to give it a try. I made your enchilada recipe today for lunch. So delicious. Now I have half a head of cauliflower lying around… clearly this recipe is calling my name! Happy Super Bowl! 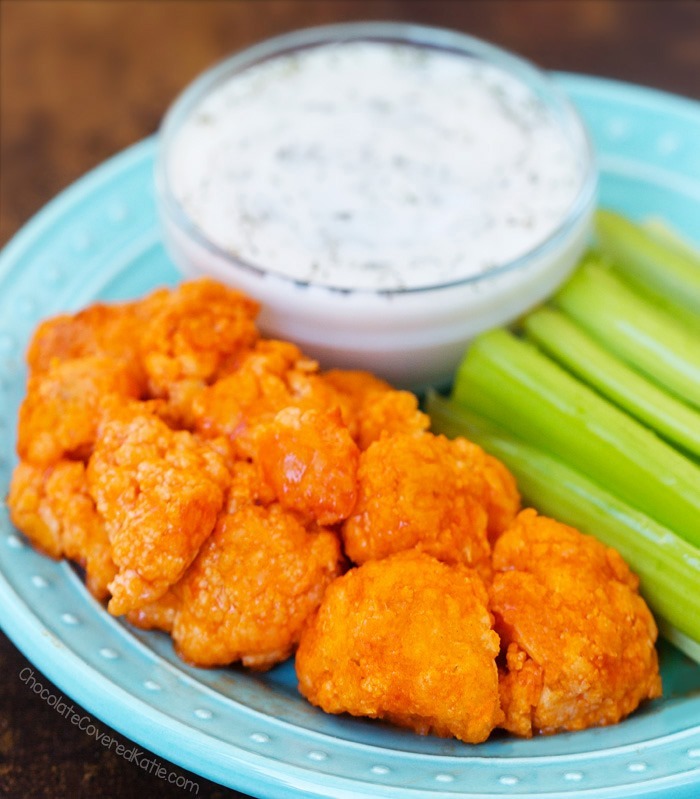 These cauliflower buffalo wings look so so much tastier than any real buffalo wings (ick!)! Definitely would be putting this on top of a salad as well. They’d taste so delicious with fresh butter lettuce! Do these get crispy or do they stay on the soft side? 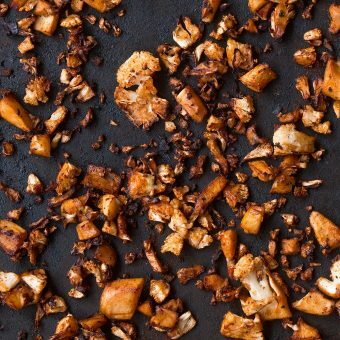 Every recipe I’ve tried for buffalo cauliflower has had soggy results, even after broiling (well, the undercooked parts are crunchy and the burned parts are crispy!). I’ve had the same results and the coating also falls off. Anyone have any pointers for getting them crispy? I love substituting roasted cauliflower for chicken in recipes. This, however, was a bit spicy for me. If I made it again, I’d replace half the buffalo sauce with maple syrup. – I used just under 1/2 a cup of buffalo sauce, and I added maple syrup till it was at the half-cup mark. 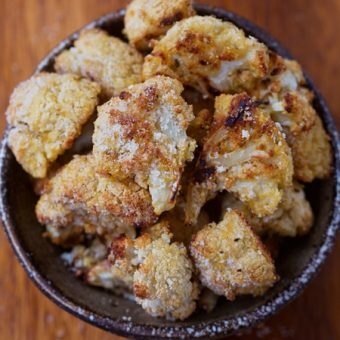 – I also completely skipped the breadcrumbs step, to keep it healthier, and it still turned out delicious. Thanks for sharing this recipe. 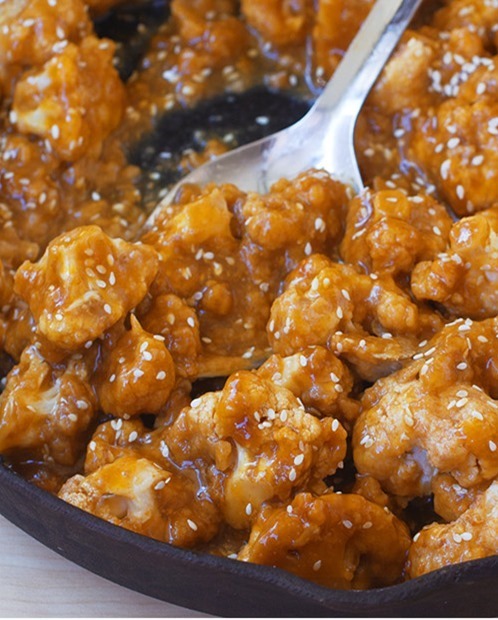 The sesame cauliflower recipe remains my favorite, though. Hi, do you mean the cauliflower, not celery? I think that this recipe is brilliant! I totally agree with Andrea when she said that people really eat the wings for the added flavor and not the unseasoned/unflavored plain meat. Did you make that ranch dressing or was it store-bought? If you made it, would you be willing to post a recipe for it? Where can I find a buffalo sauce that doesn’t have icky ingredients such as imitation butter flavor? Wings Wings Wings! This has even been one of my families favorites. Vegan and non vegan! We can’t get enough of it. I haven’t tried making different flavors just the buffalo but will give it a shot! It’s awesome to have as a side for pizza night, yummy snacks, of family and friend gatherings. I’ll will need to try different flavors and add it to my posts! I just made these for the Superbowl and they were awesome! Even my meat-loving husband loved them!! Thank you for this great recipe Katie! I made this last night for the Super Bowl and it is the BOMB. I doubled it because I had a whole cauliflower and was serving 8 adults. People were scraping the bottom of the serving dish to get the little bits leftover. I wondering how fast I can get to the store to buy more cauliflower so I can make it again. Seriously. looks delicious! i love cauliflower wings! The taste is great but the coating didn’t crisp up and some fell off. Followed the recipe exactly. 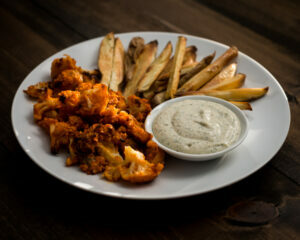 These are so good & one of my favorite buffalo cauliflower recipes I’ve tried! I made them gluten free by using Bob’s gf flour & gf breadcrumbs. Thanks for another amazing recipe! Your photo looks even better than Katie’s! Hey Katie. So I made these and non vegetarians ate them up like the world was about to end. Lol. However, I was in a rush to a point,but the breading didn’t end up adhering like yours did. Still very tasty! Just made these, subsituting buffalo with mango habanero and they turned out amazing. I also used whole wheat flour for the breading. Great recipe, thanks. I’ll try it with the Buffalo sauce next time.